At this year’s AERO, RS Helikopter GmbH will present its single-seat coaxial helicopter RotorSchmiede VA115 ultralight, which received the German Type Certificate in October 2018. Consequently designed for flying fun, the RotorSchmiede VA115 ultralight has the lowest price of all certified helicopters in the world – close to the cost of a gyrocopter! A technical highlight this year are the carbon fibre composite rotor blades developed by RotorSchmiede, which offer advantages in performance and handling due to their high rigidity. Also on display is the RotorSchmiede VA115 trainer, a training platform with adjustable degrees of freedom, which makes getting into helicopter flying easier in a particularly secure and cost-effective way: it can be mounted in no time at all under any RotorSchmiede VA115 ultralight. RS Helikopter GmbH is looking forward to offer visitors a special exhibition discount. 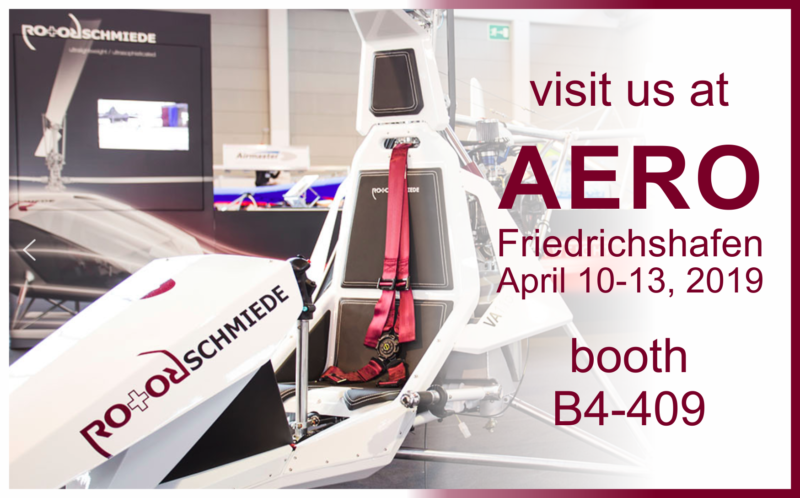 Visit us at AERO Friedrichshafen, booth B4-409, from 10 to 13 April 2019.